MANAK Awards Opening of online system for nominations under revamped INSPIRE Award (Million Minds Augmenting National Aspiration and Knowledge) to align it with action plan for "Startup India" initiative launched by the Hon'ble Prime Minister of India. INSPIRE-MANAK Regional workshops have been held by Department of Science & Technology, in coordination with the National Innovation Foundation, to sensitise all stakeholders regarding its implementation. Broad details of the revamped scheme details provided here. For the year Academic year 2018-19, online nominations through E-Management of INSPIRE Award Scheme open to all the schools . Concerned State Nodal Officers may kindly be directed to apprise the school suitably so that they can nominate their students. It may kindly be also noted that submission of project synopsis (in word or pdf format) has now been made mandatory alongwith submission of online nominations. Therefore, registration of all unregistered schools at E-MIAS website (www.inspireawards-dst.gov.in) may also be got expedited so that they too can avail benefit of the scheme. 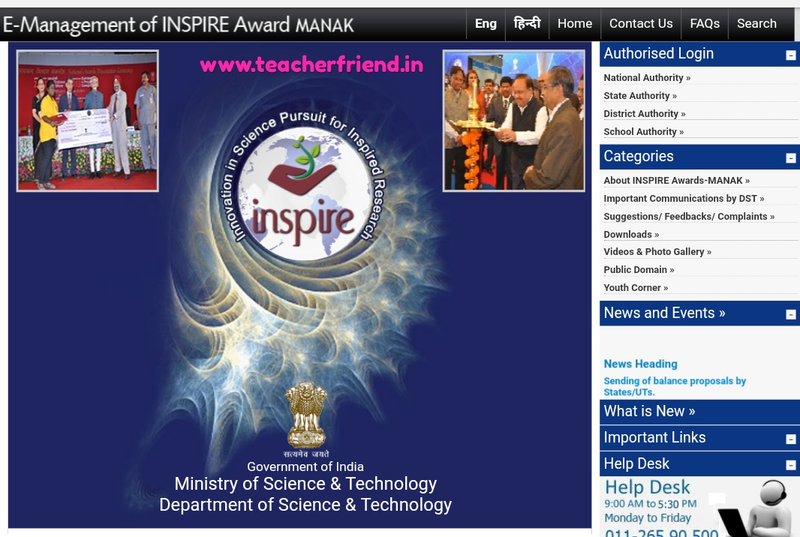 The date for online nomination for INSPIRE Awards MANAK is extended to July 31st 2018 for the year 2018-19 SCERT, AP Amaravathi Implementation of INSPIRE AWARDS - MANAK- Opening of online system for nominations under INSPIRE Award Scheme. The attention of all the District Educational Officers, Principals DIETs, CTEs and IASEs in the state is invited to the reference cited, wherein Joint Secretary to GOI, DST, New Delhi has informed that the INSPIRE Award Scheme is being revamped under the name INSPIRE AWARDS - MANAK (Million Minds Augmenting National Aspiration and Knowledge) to align it with action plan for "Startup India" initiative launched by the Hon'ble Prime Minister of India. JS also informed that, for this year, online nominations through E-Management of INSPIRE Award Scheme (E-MIAS) from 01-04-2018 to 31-07-2018. Get Online Nomination Registration Process Click here. Get Download Complete Action Plan Guidelines Instructions INSPIRE-MANAK Click Here.